Research validates that the best learning occurs when students are engaged and focused. In turn, we want students to achieve mastery, become confident learners, work collaboratively, and persevere in their academic, professional and social lives. At Highlands School, we believe that the integration of project-based learning promotes engagement and challenges students to think critically and problem solve using their knowledge of the curriculum. While emphasizing the development of 21st century skills, students experience real-world applications fostered by authentic research. Project work involves an investigation of a topic of interest to the students in which they become experts through in-depth exploration. 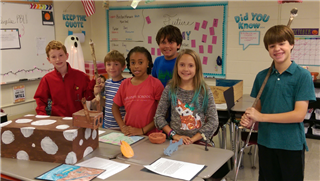 As the method is cross-curricular, multidisciplinary components are seamlessly woven into the curriculum, and therefore standards are covered through the project work. In addition, the collaborative nature of project work aids in building community as all students are encouraged to participate in various ways. As a culmination of each study, students share their experiences, knowledge, and representations/products with an audience. We invite you to come and learn more about our approach to project-based learning. The Project Approach, a specific kind of project-based learning, brings a number of advantages to any classroom and represents best practices in 21st-century education. Educators and researchers share their views on why project-based learning is an important learning strategy for classrooms. Museum style learning exhibits on display from Highlands School students who will also serve as docents. A night to celebrate the enduring understanding fostered by Project Based Learning.